Whether you're styling your pint-sized apartment, or just your petite powder room, any small space decorating can be made easy if you go about it in the right way. No matter what the scale of the project, some planning is always required. An undersized area needs an oversized amount of thought, but the result is a fully-functional and practical, warm, liveable space. 1. Multi-purposing: If you don't have room for separate living and dining areas, combine the two by purchasing a high, streamlined sofa or sofa bed and a few side chairs that can be tucked away when not in use. When dining, bring the chairs in towards the sofa and use a round dining table in the middle. If you decide to go with the option of the sofa bed, this room is now not only a living and dining room, but also a guest bedroom. Also consider multi-purpose furniture: a large ottoman with a top that opens can serve as a coffee table, extra seating and even storage for blankets and pillows. 2. Proportions: If your furniture is oversized in comparison to the area it's in, then you will not get maximum use out of every inch of your home. Choosing furniture that is proportionate to the space is key when designing your place. Don't fall in love at first sight. Bring a measuring tape with you when you go shopping (which will become your best friend when furnishing a small space) and if the piece is too big just walk away! You'll find something better! 3. Contain the clutter: Practical storage solutions are a must when space is limited, so make use of your vertical space. Consider hiring a company that specializes in custom-built closets. Closet organizers will save your life! Floor to ceiling wall units and book shelves are also a great way to make use of the vertical space in your home, and can both store items and show off some prized possessions. 4. Open Furniture: Furniture that has legs tends to create a feeling of more openness in a space. Having a few pieces with closed bottoms such as an ottoman or a few stools is good for variety, but the majority should be open at the base. Transparent furniture also really opens small spaces (for example the popular "ghost" chair) and is typically lightweight and easy to move about. 5. Visual Flow: Visual flow is the path your eyes take when looking at something as a whole. Your eyes should not focus on one particular area of the home. Your space should balance, creating harmony. I create harmony by using a combination of elements, such as a variety of textures. Mix different fabrics together: silk, chenille, linen, suede, velvet and sheers all together in monochromatic tones. Maintenance plays a big role in creating harmony -- visual flow will be obstructed by clutter, so keep everything simple, clean and organized. TIP: Paint your walls, trim, ceiling and crown all one colour, using a satin finish for the trim with matte walls, for continuity with sophistication. I suggest Benjamin Moore's OC-23 Classic Gray for a subtle, warm neutral. 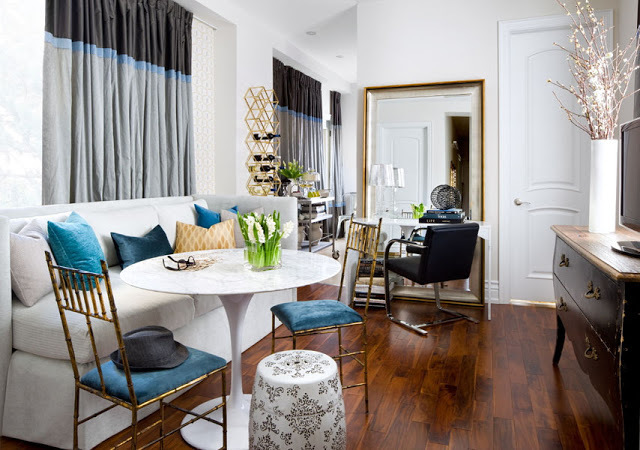 Designing your small space may feel like a challenge at first, but if you tackle it in the right way you'll be amazed with the results, and how it ends up not feeling like a small space after all.